I’m so blown away by the latest from Thrity Umrigar. I was a bit underwhelmed by her previous book, The World We Found, but I loved The Space Between Us, so my hope was that her new book would lean more toward The Space than The World. 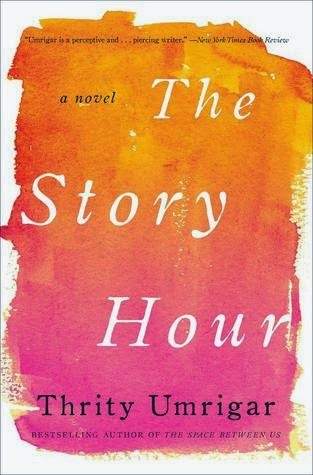 It seems my prayers were answered because The Story Hour is a fantastic read. Brought to the U.S. by a husband who is a relative stranger to her, Lakshmi’s world is extremely small, consisting of days working in the store/restaurant her husband owns and nights in the apartment above the store. So small is her world that her interactions are limited to her husband, a co-worker and customers. When a long time customer that she considers her only friend announces that he’s moving away, Lakshmi is devastated. Lonely and faced with spending the rest of her life friendless and in a loveless marriage, she tries to kill herself. Maggie has a good life with her husband, Sudhir. She enjoys her work as a psychologist and, while she likes most of her patients, she’s always kept a personal distance from them. When she encounters the young Indian woman in the hospital, she’s immediately drawn to her and her story. As the two work to create a stronger and more confident Lakshmi, that lines between personal and professional are blurred, resulting in an unexpected friendship. Umrigar is at her best when she explores the complexity of relationships. Whether they’re between spouses, family members, friends or strangers, she expertly peels back the complex layers and displays the simplistic nature that lies at the heart of all relationships. In The Story Hour, this is especially important as she dissects the fragile relationship between an Indian immigrant and black American woman. Often, when immigrants arrive in the U.S., it’s with preconceived notions. Western television and media influences how they view people they’ve had little to no contact with. Because of this, immigrants are more likely to believe that African Americans are dangerous and should be avoided, while believing that white means safety and whiteness is something to aspire to. I don’t think I’ve ever read a book that broached this subject and Umrigar handles it extremely well.